Brazil: Fire compromised stability of Arena Pantanal? Revealed by Reuters last weekend, a report by state authorities suggests that fire from October 2013 could “compromise the overall stability of the construction” in Cuiaba. 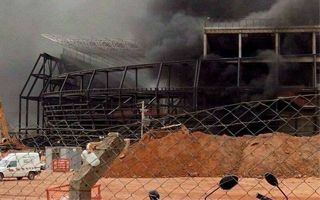 For those of you who don’t remember, on October 25 2013 fire broke out under one of Arena Pantanal’s stands, resulting in clouds of black smoke visible from afar. Though very disturbing, the fire was dismissed of having any impact on the overall structure. “To our knowledge, including recent inspection reports from our technical stadium experts, only insulation material, piping, electrical cabling, pathways and switchboards, etc were damaged as a result of the fire, and that these installations and materials were being replaced along with other components in the affected areas”, a FIFA spokesman told Goal.com. However, a report by Mato Grosso state public ministry was handed over to Reuters recently. The agency revealed during the weekend, that the 18-page document shows more serious consequences of the October fire. According to the document by local prosecutor’s office, the accident could “compromise the overall stability of the construction”. Neither FIFA, nor the Local Organising Committee claim to have been aware of this, but an independent inspector was immediately sent to the site on Monday to further evaluate outcomes of the fire. The state agency overseeing the stadium's construction denied on Sunday that the fire had caused structural damage and said the prosecutor's report was drafted before recent repairs were completed. The repairs, the agency said in a statement, were followed by stress tests and assurances given by the builders to the state agency that no structural damage exists. Below is a photo enclosed by Reuters, depicting the stadium after fire was extinguished. It shows significant lacks in prefabs of the structure, revealing elements of the metal rebar hidden inside.